Death isn’t always the end, as years of comic books, movies, novels and more have led us to believe. For Kathrine Sartori, death didn’t mean death; it meant something far more exciting and puzzling: that’s the premise for Dark Horse Comics latest Berger Books release, The Girl in the Bay. From comic book legend J.M. 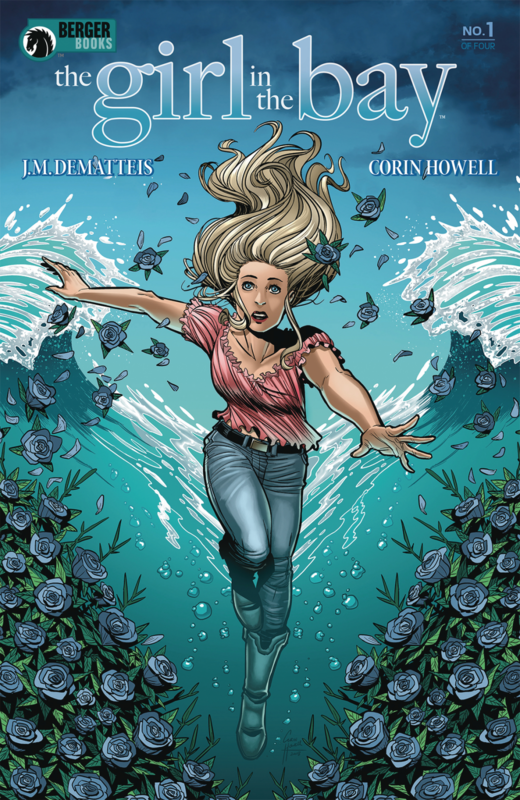 DeMatteis with art by Corin Howell (X-Files, Mighty Morphin Power Rangers) with colors by James Devlin and letters by Clem Robins, this is a very different kind of murder mystery. Kathrine Sartori was a life loving hippie in ’69, living a life of experiences and narcotics. More focused on self-imposed enlightenment than any responsibilities. That is, until one fateful night when she ran into the wrong guy while under the influence and met her end. She makes it out of a watery grave somehow, but the world isn’t the same to her. Mainly because it’s 2019 now, 50 years have passed her by. But that still isn’t the strangest part: no, the weirdest part is that someone else has been living her life, someone, that looks like an older version of herself. But how? Who? What? Exactly, and that is what makes this book pull you in. Who was the guy that ended her life all those years ago? How is this all possible, and who is the mysterious woman in the painting? Questions all in need of answers. Yup, I am hooked. DeMatteis has created a story with so many layers, and so many questions. Howell’s artwork is beautiful and vibrant and captures this world perfectly. The Girl in the Bay is a next generation of murder mysteries and yet, remains a throwback. A must watch book for 2019.